My heaviest work seasons are spring and fall which, unfortunately for me, are the best fishing seasons in this area. Work was unusually slow for me last spring, so I had a lot of time to fish. This spring's workload is back to normal. In fact, I'm typing this backstage at a concert hall during a tedious soundcheck. With a busy work schedule, I haven't been fishing as much as I would like to. Though, the few times I've fished this spring have been very educational. My usual springtime routine is to target sea run brown trout, with striped bass as a welcome by-catch. My fishery is a very fickle one. It produces very little most days, so ample water time (or good timing luck) is a must for any positive results. I'm beginning to realize that my schedule as a musician and a parent isn't giving me enough time to focus on this fishery as it requires. It's okay though. I'm really enjoying fishing for American shad and it is allowing me to hone some skills I might not have a chance to use otherwise. 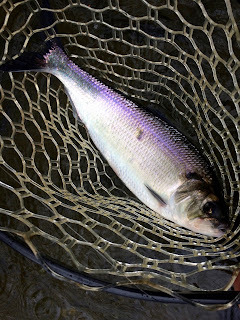 Last spring, I spent most of my shad time on a tributary of the Connecticut River. This spring, most of my time thus far has been spent fishing the Connecticut itself. I described my first trip the Connecticut in a previous post. This post deals with two trips, a week apart from one another, and some of the lessons I learned from both. The first Friday trip was cold and very wet. I started at the tributary to see if it was worth staying there for the evening. I caught one big roe shad right away, but the action died soon after. I decided to move to the big river. The flow was heavier than my previous trip, so I swapped a F/I/S2 Scandi head for one with a faster sink rate, I/S3/S4. I hooked shad every so often, but the bite wasn't exactly on fire. Still, I had about a half dozen to hand before they really turned on. After that, it was about two and a half hours of non-stop action, with most of the fish being big females. I didn't stop to take fish pictures. I wanted to keep my fly in the water. The highlight of the evening was a shad who tried to take my fly back to the Bay of Fundy. Line was screaming from my reel as she passed by a line of spin fishermen. She jumped as high as I've ever seen a shad jump and I knew I had hooked a really large fish. Sadly, the hook pulled upon reentry. The decision to switch to a fast sinking head had paid off big time. Then, during a lapse in good judgement and self control, I decided to cut my fly off so I could get out before dark. Shad had been nailing my blue fly and I figured that unstrinting the rod was the only way I could force myself to leave. I usually leave it strung up on the hike out. Wrong move. On the hike out, the top section of my rod fell off. I didn't notice until I was back at the car, then panic ensued. A team of gracious fishermen helped me look for it, but it was too dark. Gah!! I use this rod a good part of the year and it's no longer made. The Blue one has been the top fly for me this season so far. The green is a distant second. Fortunately, an eagle-eyed fisherman found it the next day and my friend Mike took possession of it. Phew!! The Scandi head sink rate lesson was a big one, but this one was much bigger! Now, when it's time to leave, it's time to leave, and I'll either leave my rod strung up or bring the tube. The next Friday was colder and even wetter, however, the river was lower. I was reunited with my rod tip, thank goodness. 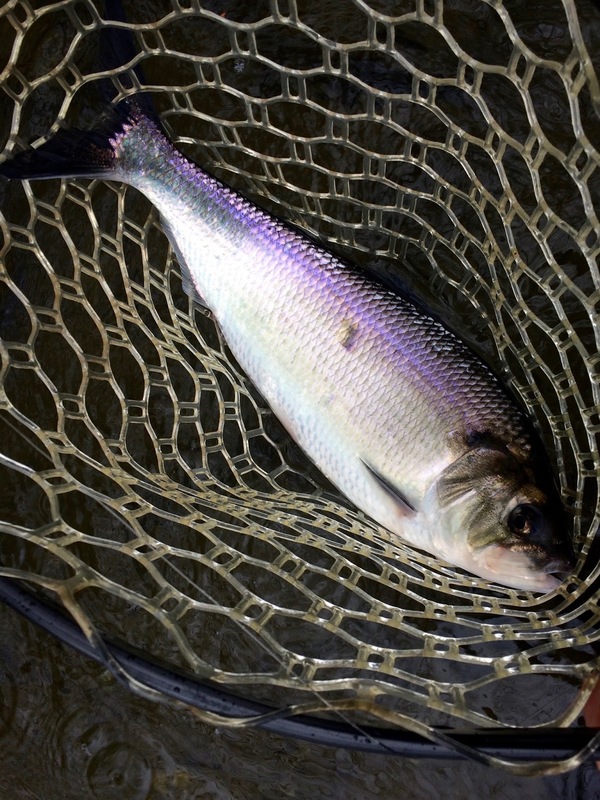 The shad were lying in the main current of a very wide river. Even with a two handed rod, I couldn't reach most of them. They were just too far away. I knew I could nail a few stragglers traveling on the inside edge of the current, so I went to work. I got a couple on the same setup, but then I had a long stretch with no activity. After trying different fly colors and retrieves, I wondered if I should be fishing higher in the water column and with a smaller fly. I took a break and switched back to my F/I/S2 head and tied in my lucky blue fly, tied smaller and lighter than the original. That was the ticket. I didn't rack up big numbers like the previous week, but I had decent action until sunset. It made me realize that I should have two rods that use heads in the same grain window. It would make switching rigs much easier and quicker. I'll be ordering one in the near future. There have been other trips since these two. Each trip to the Connecticut is getting a little less productive than the last. The water finally warmed up, causing the fish to run upriver. I think it's time to concentrate on the tributaries. At first, I was sort of bummed that I couldn't fish the tribs. Then, I began to enjoy fishing the big river. 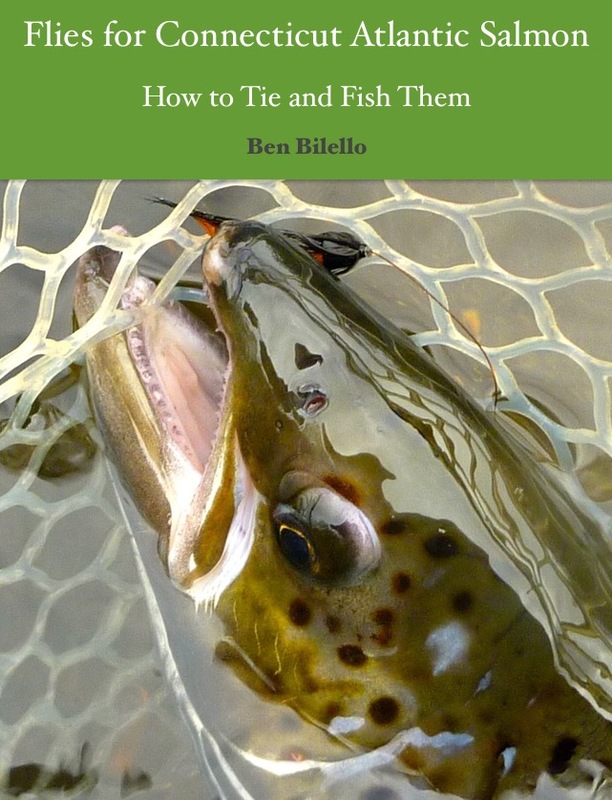 It's challenging and it's making me a better sunk line fisherman, which will come in handy when Atlantic salmon fishing in challenging conditions. There is something to be said about going outside of one's comfort zone, even if it means temporarily catching fewer fish. I thought of it as a good investment of my time. It definitely paid off. Now that I figured out the "how" a bit better, my next goal is to start nailing the "when." That comes with time on the water and seeing specific situations repeat themselves. I don't know when I will find myself in situations like these again, but I will be a little more prepared, as well as ready to make the leap more quickly. They are pretty fish...and that one is the tops.